Mama Love: ILuv MobiOut Review! I was recently contacted about reviewing the MobiOut by ILuv, and I was so excited to be doing this review, I mean I get excited about all reviews, but this one had me waiting and watching for it to be delivered! 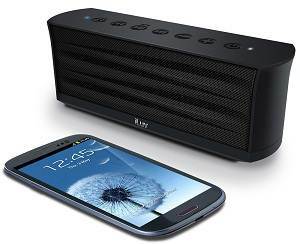 Well, it's a lovely, Rechargeable Splash-Resistant Stereo Bluetooth Speaker with Jump-Start Technology! "Set the mood at your next barbeque, pool party or picnic with MobiOut, a splash-proof and rugged yet elegant Bluetooth speaker that combines high-fidelity sound with wireless portability. MobiOut is sturdily constructed to withstand a few knocks and bumps, and contains a passive radiator that provides deep, resonant bass. Control your music and calls with top-mounted volume and playback buttons that are sealed to keep water out. It also contains a hands-free speakerphone with a built-in microphone so you can even take calls. What's especially unique about MobiOut is that it features Jump-Start Technology, which means that you can use it as an external power source to charge your phone. It can be frustrating when your speakers are charged but your phone isn't, so we added this additional feature to improve MobiOut's functionality." I Loved it! I was a little worried about setup, because I'm not 100% great with techy gadgets but it was a breeze! I literally took it out of the box, followed the very simple instructions, charged it, then connected my phone to it through bluetooth! It was so easy! How did it work? Wonderfully!! The sound it amazing the speaker is compact and designed very well, durable, and attractive, and the features are simply fantastic! I had my phone in my pocket and the speaker on, and I could simply press the skip,pause,play, stop etc buttons on the speaker instead of unlocking my phone and etc, also one of my favorite features was the Call Receive End I received a call while connected to/using the MobiOut and all I did was simply press the button and I was connected to my call, could hear/talk all through the speaker! My other Favorite feature of the Mobiout would have to be the JumpStart Technology, when the speaker is charged you can use it as a backup battery for your phone! And I know I will be using the Jumpstart a lot, My phone is always dying on me! Overall I know we will be using the MobiOut a lot, taking it to softball games, to play discgolf, swimming, hiking and just around the house! I'm too excited to have to MobiOut for us to take our Music with us on our adventures now!